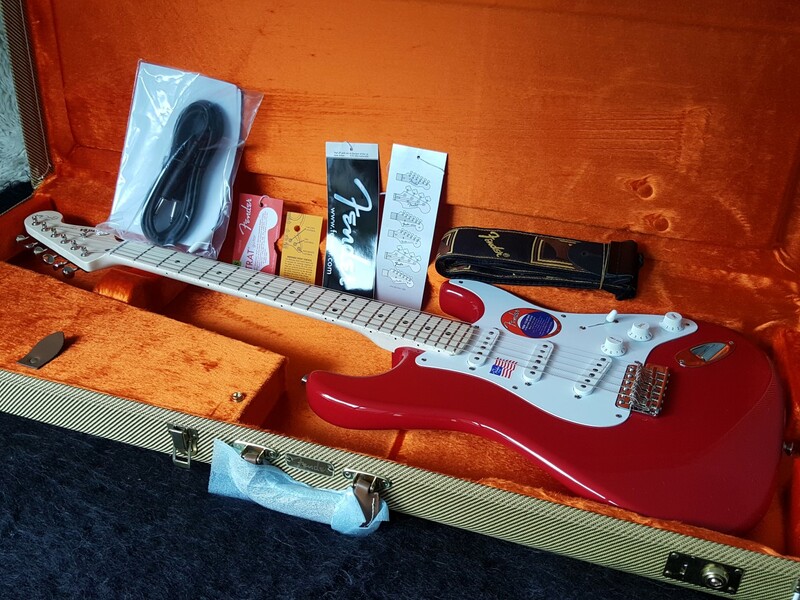 Fender 2016 Eric Clapton Artist Stratocaster - Torino Red. Brand new, un-played, not been a demo, genuine Made in USA. Experience the peerless Strat® style of Slowhand himself with the Eric Clapton Stratocaster, one of Fender's most acclaimed and enduring artist signature models. With classic design and special features that give it exceptional tonal versatility and effortless feel worthy of one of the world's greatest names in rock and blues, it puts pure Clapton Stratocaster tone and feel straight into your hands. The "soft V" neck profile (the shape of the neck in cross section) on the Eric Clapton Stratocaster has a distinctly comfortable fretting-hand feel that takes the more pronounced sharpness of a '50s "V" profile and "softens" it into a somewhat more rounded shape. The first tone control knob operates this guitar's TBX (Treble Bass Expander) tone circuitry. The knob has a detent at the center position (5) and works like a normal tone control from zero to the detent. Turning the knob clockwise from the detent adds presence and brightness; turning it counterclockwise from the detent rolls off high frequencies. The fingerboard radius is an important spec that describes the amount of curvature across the width of the fingerboard. This instrument's modern 9.5" fingerboard radius is slightly more flattened than a vintage-style radius to make bending notes easier.